WATCH Who is Cory Booker? After months of whispers, Sen. Cory Booker announced Friday he would embark on what is likely to be a long and crowded run for the Democratic nomination for president in 2020. "I believe that we can build a country where no one is forgotten, no one is left behind; where parents can put food on the table; where there are good-paying jobs with good benefits in every neighborhood; where our criminal justice system keeps us safe, instead of shuffling more children into cages and coffins; where we see the faces of our leaders on television and feel pride, not shame," the senator from New Jersey said in an announcement to supporters Friday. Booker's announcement comes on the first day of February, which is Black History Month. Booker, if elected, would be the second African-American president in U.S. history. Sen. Kamala Harris, D-Calif., who could be the first African-American woman to be elected president, announced her run recently on Martin Luther King Jr. Day. Booker and Harris join Sens. Elizabeth Warren, D-Mass., and Kirsten Gillibrand, D-N.Y., as members of the Senate seeking the Democratic nomination. At least five other Democrats have also declared campaigns. Elected to the U.S. Senate in a special election on Oct. 16, 2013 and then reelected in 2014, Booker serves on the Foreign Relations, Judiciary, Small Business, Entrepreneurship, and Environment and Public Works committees. Booker has recently been hitting key 2020 states as senator, including a trip less than two weeks ago to South Carolina for Martin Luther King Jr. Day and a trip to Iowa in October where he gave a speech at the Democratic Party's fall gala. He was one of the first high-profile Democrats to touch down in the state ahead of 2020. 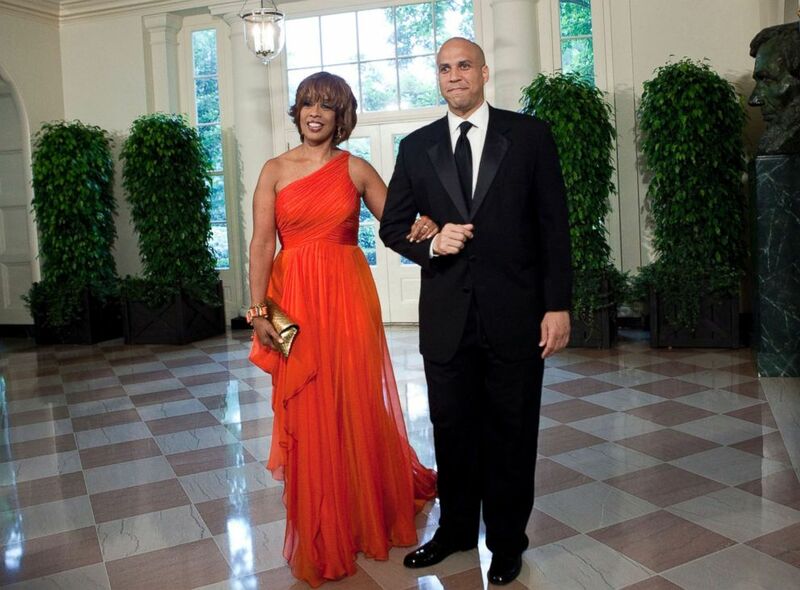 Gayle King and Cory Booker, Mayor of Newark, N.J., arrive at the White House for a state dinner May 19, 2010 in Washington. Booker was born in the nation's capital but grew up in suburban New Jersey, the son of two IBM executives. On the trail, Booker often tells the story of his parents and how they bought their first house in the mostly-white neighborhood where Booker was raised: After being denied the house by a real estate agent who they suspected was discriminating against them for their race, Booker's parents arranged for a sting-operation of sorts, asking a white couple to go forward on the sale on their behalf. They eventually succeeded and moved into the neighborhood. After high school, Booker moved west to Stanford University in California, where he played football. Booker also attended the University of Oxford in England as a Rhodes scholar and received a graduate degree in 1994. He then went to Yale Law School and became an attorney in the non-profit sector, according to his Senate biography. He was elected to the Newark City Council in 1998 and rose through the ranks to become mayor of Newark in 2006. His unexpected victory, in which he unseated the longest-serving mayor in the city's history, Sharpe James, was the subject of a documentary called "Street Fight." 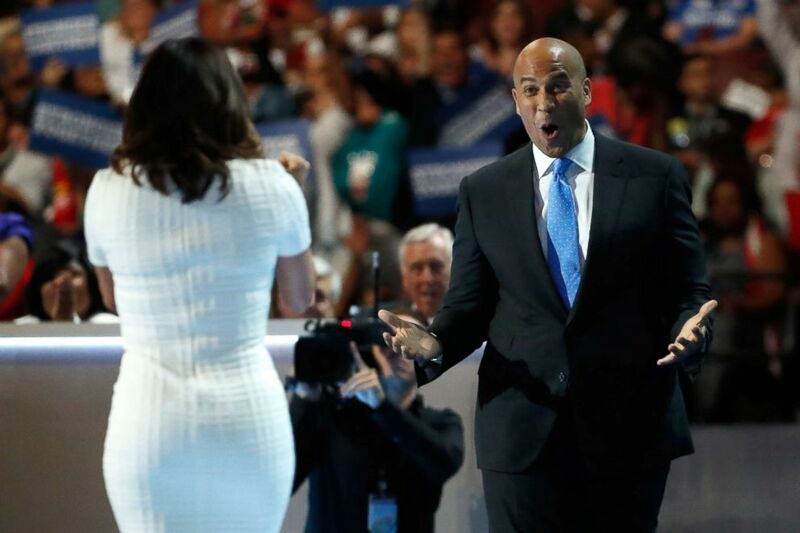 Sen. Cory Booker reacts after actress Eva Longoria introduced him on the first day of the Democratic National Convention at the Wells Fargo Center, July 25, 2016, in Philadelphia. Booker served over seven years as mayor of Newark, where he first vaulted to national attention for his youth and hands-on approach in attempting to turn around the crime and poverty-plagued city. Prior to Barack Obama's election in 2008, some in the Garden State familiar with the ambitious mayor's work, which included frequent ride-alongs with the city's law enforcement and, later, a high-profile education partnership with Facebook, openly mused about him becoming the country's first black president. Since arriving in Washington, Booker has attracted notice for his leadership during the bipartisan effort to pass criminal justice reform and for his pointed questioning during Senate Judiciary Committee hearings. That includes what he described as his "Spartacus moment" during Brett Kavanaugh's Supreme Court confirmation hearings last fall. Later mocked by Republicans for grandstanding, the senator exposed himself to punishment by releasing confidential documents. 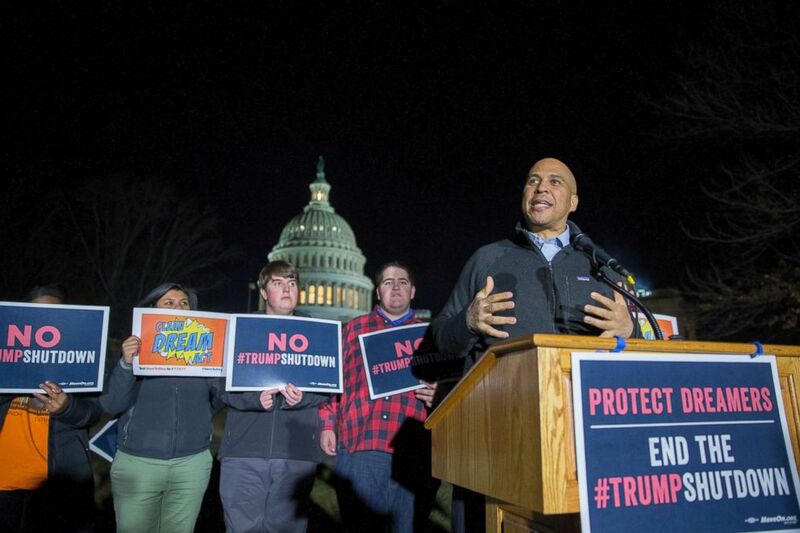 Sen. Cory Booker speaks at a rally outside the U.S. Capitol on Jan. 19, 2018 in Washington. “Even in the face of defeat, we cannot be defeated. Even when we’re knocked down, we can never be knocked out,” said Booker, speaking in Iowa after Kavanaugh's confirmation. Freshly graduated from the elite Ivy League in New Haven, Booker picked up and moved to a housing project in Newark. This decision molded into the reputation he developed as a hands-on mayor. The senator still lives in Newark, having spent two decades as a resident of the city. He lives in the basement apartment of his brother’s townhouse. Booker isn't married, nor is he in a publicly-disclosed relationship, and if elected, he would be the first bachelor president in over a century.